Propane is a widely used element the benefits many things within the home. From propane dryers to your traditional propane heat, you may not realize that you’re using propane for your everyday appliances. You may recognize some of these practical ways propane is helping you and your family at home. Propane heaters are thought to be more durable and accurate when you need them. They take up very little room and are only used on demand. They also vary in size and offer more ventilation and installation opportunities to meet your needs and last much longer than gas powered water heaters. For efficiency and safety purposes, manufacturers are turning to propane powered cooktops and stovetops. Not only will you save with an energy efficient propane stove, using a propane powered stove can save you money as it uses absolutely no electricity. You are able to control the temperature at your prefered adjustment, allowing for evenly cooked foods. Your expert contractor that specializes in residential propane in Port St. Lucie can provide the most efficient stovetop for your kitchen. According to The Hearth, Patio & Barbecue Association, 65% of homes have a fireplace or other hearth items. Even in climates where the weather is not as cool others, the cozy and inviting appeal of a fireplace is favored among homeowners. Propane powered fireplaces offer less of a hassle than traditional fireplaces. You don’t have to worry about leftover wood pieces or embers or making sure you remember to open or close the vent. Propane powered fireplaces can be adjusted with a remote control or switch on the wall. 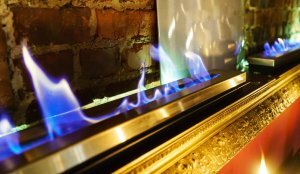 Another energy efficient benefit about propane fireplaces is that they don’t require a vent while the fire is going. If you’re inquiring about a fireplace for your home, contact your local propane provider in Palm City. Now that you’re aware of the many uses of propane in your home, it’s time to exchange some of those inefficient energy appliances to propane powered efficiency. And the best resource to help your propane needs is through your local propane company in Palm City. Elite Gas Company has served the Palm City, Jensen Beach, Port St. Lucie, Vero Beach, and the surround area for over 20 years, meeting the needs of those who have emergency gas issues. Whatever your propane needs, they have you covered. Call them today for recommendations on how propane can help you maintain an energy-efficient home all year long. Where Does Propane Gas Come From? Elite Gas Contractors has been trusted as a locally owned and operated gas installation service company for over 16 years. With the expansion into propane delivery, Elite Gas Contractors is now a full service gas company giving customers a personalized experience no other gas company can provide. Our Elite Gas Contractors service team repairs all gas appliances and our sales executives are experts at creating tailored plans for new gas construction.